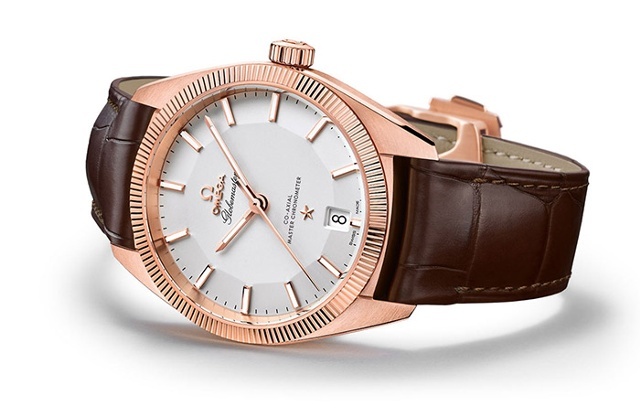 The Omega Globemaster references design cues from the Omegas of the 1950s and 1960s, but with updated credentials. New examples offer COSC certification as well as Omega’s own METAS certification, both attesting to the Globemaster’s exceedingly high technical marks. This refined dress watch slides right into the Omega Constellation collection and it feels as though it has always been there. The 2016 models, including a previewed annual calendar version, arrive in 41mm sizes, up from the 39mm models seen last year. 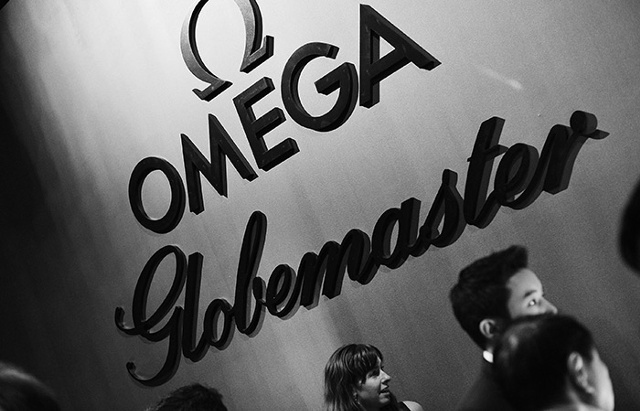 The Omega Globemaster of today visually syncs with Omega’s historic aesthetics due to its key historical elements. The pie-pan dial, named understandably because of the angled edges, is drawn from the first Omega Constellation from 1952 and adds dimension to the clean dial. The applied five-point star is reminiscent of Omega’s history, while the updated three-dimensional markers are filled with Super-LumiNova. Surrounding the elegant dial is a fluted bezel that references the ridged bezel of the classic Constellations while enhancing the sophisticated style of the watch. Another historic design cue is found on the backside of the case. The sapphire crystal is fastened with four screws; in the center is a medallion stamped with the cupola of the Geneva observatory and eight stars in the sky. The dome of the Geneva Observatory and the eight stars has been a symbol of the Constellation line since 1952 and reflects important timing achievements for Omega. In 1931 Omega had a swept the competition at the Geneva Observatory and took first in each category, eight of them to be exact, hence the eight stars in the sky above the Cupola. The name Globemaster also has a bit of history in the United States. Due to a trademark conflict in the United States, the Constellation line was named Globemaster, however this issue was resolved in 1956. Many of these watches simply had the Constellation star on the dial. 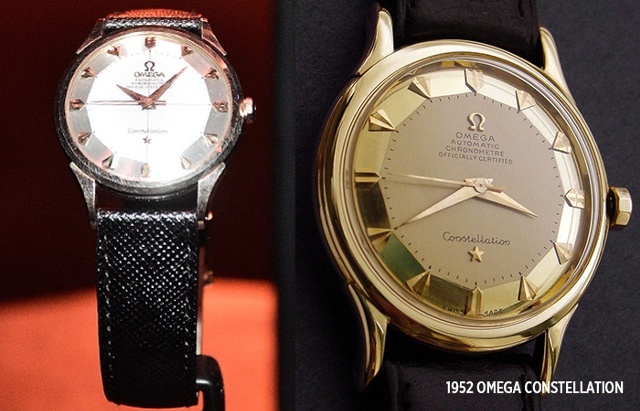 The 2015 and now the 2016 Omega Globemasters reappear refreshed and distinguished. The 39mm and 41mm (for 2016) timepieces are every bit of a classic and available in three varieties of metal: Sedna gold, yellow gold and stainless steel, plus a two-tone version with stainless steel and gold with either a silvery opaline dial or a deep blue. Platinum models are also available. Placed on a bracelet, the watch feels sporty while the leather strap enhances its dressy characteristics. 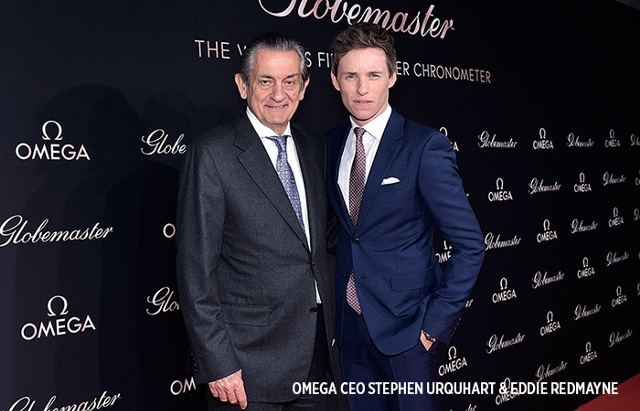 While the classic and timeless design of the Omega Globemaster will endure through the decades, so it’s no surprise that you will find this classy timepiece on the wrist of stylish men, including new Omega ambassador Eddie Redmayne‬. At the Globemaster’s core is the true star, the Omega Co-Axial Master Chronometer caliber 8900/8901, which Omega has equipped to subvert most any chance that a strong magnetic force will damage it. It’s prepared to guard against any magnetic exposure up to 15,000 Gauss –easily among the very highest levels of movement protection anywhere. The self-winding movement powers the hours, minutes, seconds and date while the double barrels ensure a power reserve of up to sixty hours. Further improving the precision, stability, and durability of the Globemaster is the famed Omega Co-Axial escapement. Reducing winding time, the rotor swivels in both direction and has an appealing finish of Geneva waves in arabesque. 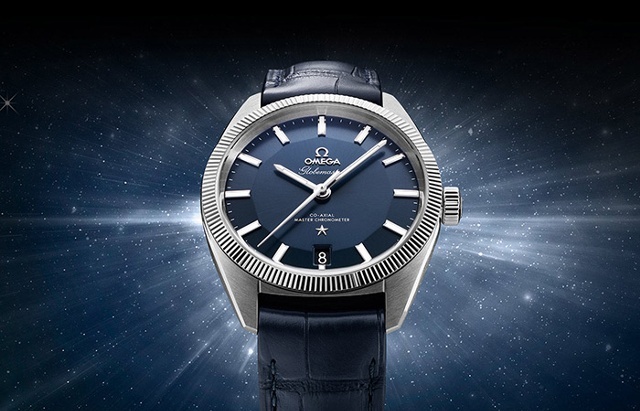 Omega raises the bar, as the 2015 Globemaster was the first Master Chronometer in Omega’s world for which COSC-approval was just a starting point. 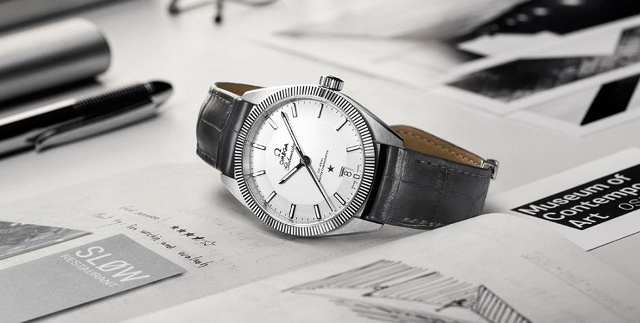 The term Master Chronometer, coined by Omega, is defined as a watch that meets the high level requirements of the Swiss Federal Institute of Metrology, known as METAS. As noted, the Globemaster doubles its certifications, surpasses the rigorous testing from both COSC and METAS, proving its quality and precision. Remember those eight stars on the case back? They represent significant Omega achievements from 1931, but for the Globemaster they also represent the above eight METAS test steps. We’ll have more about the new Globemasters as they debut during next week’s Baselworld.